Holland Heating & Air Conditioning, Inc., your local heating and air conditioning expert. We have been serving customers in Burlington County and throughout New Jersey since 1984. We service residential and commercial customers. Holland Heating and Air Conditioning, Inc. is your local Rheem dealer. Call today for a free in-home estimate and enjoy comfort and savings for years to come. Financing and rebates available. 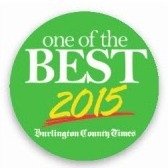 Thank you for voting us One of the Best Heating & Air Conditioning companies in Burlington County!! !